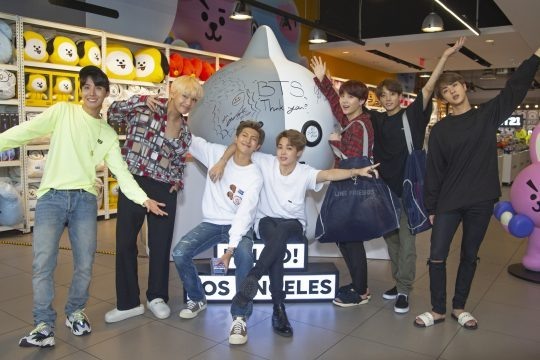 BTS made a surprise visit to a Line Friends pop-up store in Los Angeles amid its promotional activities stateside. According to Line Friends on Friday, the K-pop superstar group took a stroll around the store located in Hollywood on Tuesday. They reportedly browsed new BT21 products and participated in a hand-printing event. Their handprints will be exhibited at the store. The LA pop-up store is the second store in the US to feature BT21, a collaborative character series made with the K-pop act, after the flagship store in New York City, the company said. The LA pop-up store, which opened at the end of July, is located right across from Hollywood’s Walk of Fame. It showcases over 1,000 types of popular Line Friends character goods, including those featuring BT21. BTS is the first Korean act to play a role in the creation of official Line Friends characters. The BT21 characters -- Tata, Van, RJ, Chimmy, Cooky, Shooky, Mang and Koya -- are each associated with a member of BTS as well as its fandom Army.